We understand how overwhelming training for a healthcare role can be. The Real-time Labour Ward has sophisticated life-like mannequins which respond to your actions and display a wide range of physical states, meaning you’ll learn how to confidently deliver a baby and deal with any birth complications in an environment reminiscient of a real labour. Using our virtual tour you can explore the Real-time Labour Ward and see how we’ve designed it to reflect a modern hospital. 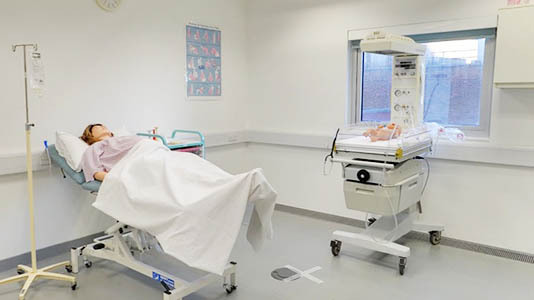 Our facilities mean midwifery students can train in a setting that promotes patient safety. The realistic setting we provide students allows them to learn from errors and know how to quickly correct them. You’ll be able to effectively manage life-threatening situations so when it comes to the real thing you’ll know exactly what to do. State-of-the-art facilities are at the heart of supporting students, allowing them to become competent and confident midwives. Understanding theory is one matter, but applying your knowledge to a real labour isn’t always easy. The Real-time Labour Ward allows for mistakes so you can learn without the pressure of putting real patients in danger. SimMom is an incredibly sophisticated piece of equipment that improves the learning experience of our midwives. With advanced technology such as SimMom we can provide our students with the most realistic setting possible. She will scream, talk and respond while you deliver her baby, and can also bleed or have a seizure. Additionally, SimMom can be cannulated and catheterised. It’s so close to the real thing that you’ll become absorbed in your role as a midwife and feel responsible for safely bringing her baby into the world. SimMom gives you the chance to learn skills that you can transfer to real patients. You’ll learn how to approach situations calmly and react quickly when complications arise. 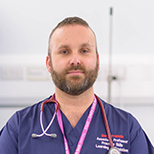 Gary Francis, School lead for practice skills learning and simulation, elaborates on how the Real-time Labour Ward contributes to the midwife student experience. What are the most valuable skills students will learn while using your facilities? GF: Students gain practical, hands-on experience in a delivery setting with an extremely lifelike patient. We’ve created an environment that is realistic and unpredictable, like a real hospital. One minute the students will be sitting in a classroom, the next minute the alarm is ringing and they’ve got to respond to a labour situation. The simulation technology we have at LSBU means our student learning is interactive. Students have the opportunity to stop and ask questions that on placement they may have not had answered due to the busy nature of hospitals. What are the benefits of these facilities? GF: With a focus on human factors, we can examine how professionals work together and approach situations. We can understand the effect of stress and fatigue on decision-making. We can see how error can be avoided and increase safety to enhance patient outcomes. Students will transition into practice and begin their career with a strong awareness and understanding of their surroundings. They’ll be able to work as a midwife in a safe and confident way. Part of our advanced patient simulator family. Learn how to correctly perform cricoid pressure. Teaches intubation, ventilation, and suction to aid airway management. Experience being a pregnant woman. Sophisticated mannequin used for teaching life-saving techniques. Dolls with detachable umbilical cord and placenta. Used alongside foetal dolls to demonstrate delivery. Life-size model used for teaching and training. Used for teaching the skills of performing an abdominal palpation. Learn how to correctly identify the dilation and effacement of a cervix both prior to labour and during labour. Enables simulating the insertion of a cannula and the skills of venepuncture.